Can you believe this was taken on November 1st??!! 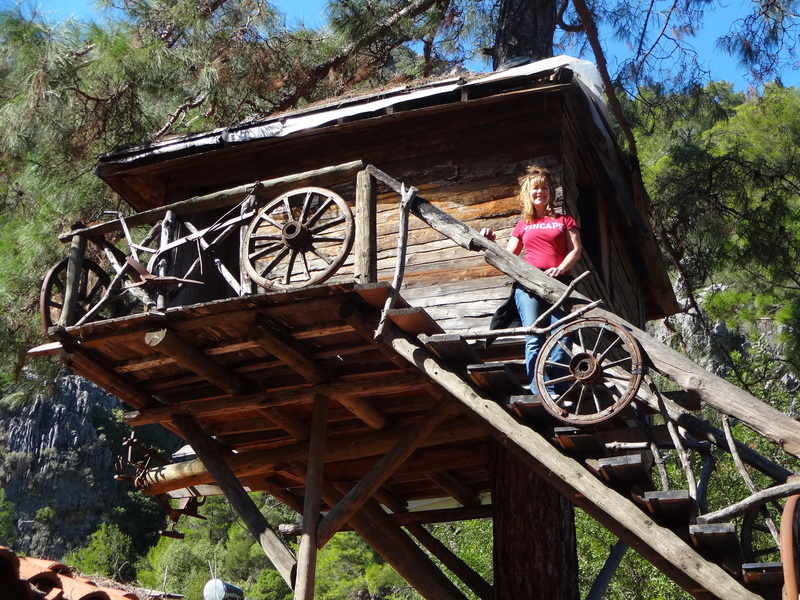 We have been to Olympos twice, and it’s one of our favorite getaway places! 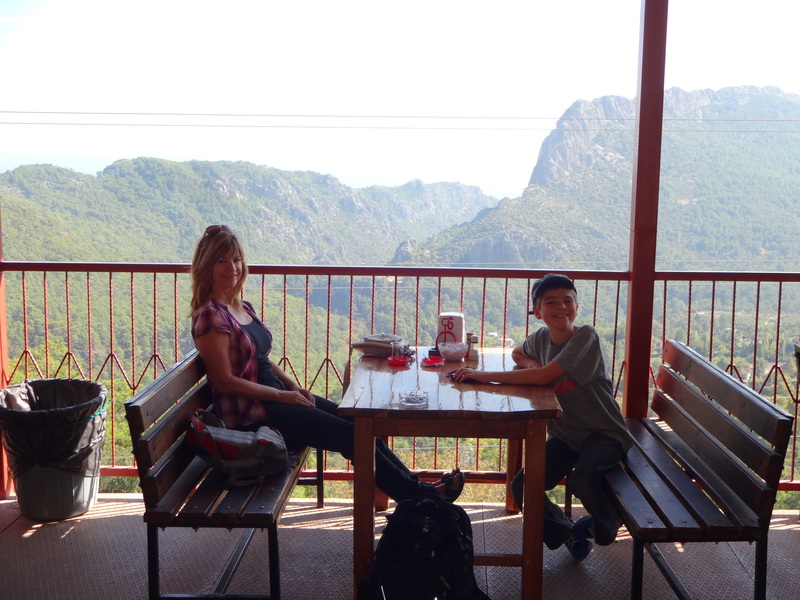 Our first trip to Olympos was last fall. We discovered that we had a very long weekend, thanks to the national holiday, Republic Day (October 29),which marks the creation of the Turkish Republic in 1923. Friday and Monday were declared school holidays due to the elections on November 1st. So, we headed for the otogar (bus station) and got into a dolmuş (public transport mini bus) and headed for Olympos. The dolmuşes leave from the far end of the bus station about every 10 minutes, so it is easy to get there via public transport. An hour and a half later, we were dropped at this cafe, where we had some tea while waiting for another dolmuş to take us down the canyon to Olympos. Not a bad place to wait, eh? Tea and snacks available while you wait. Lots of vans pull up to drop passengers heading to Olympos. 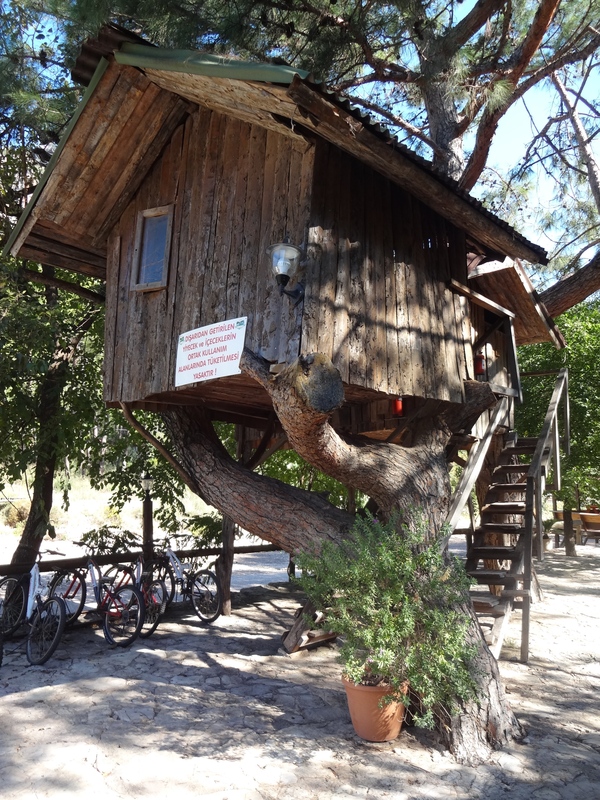 Olympos is well known for its rustic charm, with dozens of tree house and cabin pensions. We stayed in Saban’s, recommended by a friend. We loved it! Half-board was included, and the food was delicious. We had a little one room cabin, surrounded by fruit and pine trees, nestled by the hills. We left our gear and headed out to explore the ruins that everyone comes here to see. The sound of silence was fabulous to this city-dweller’s ears:). Saban’s has fruit trees all around; these are pomegranate trees. This was breakfast! Dinner was a buffet meal of delicious home-cooked Turkish food, including mezes and salad. 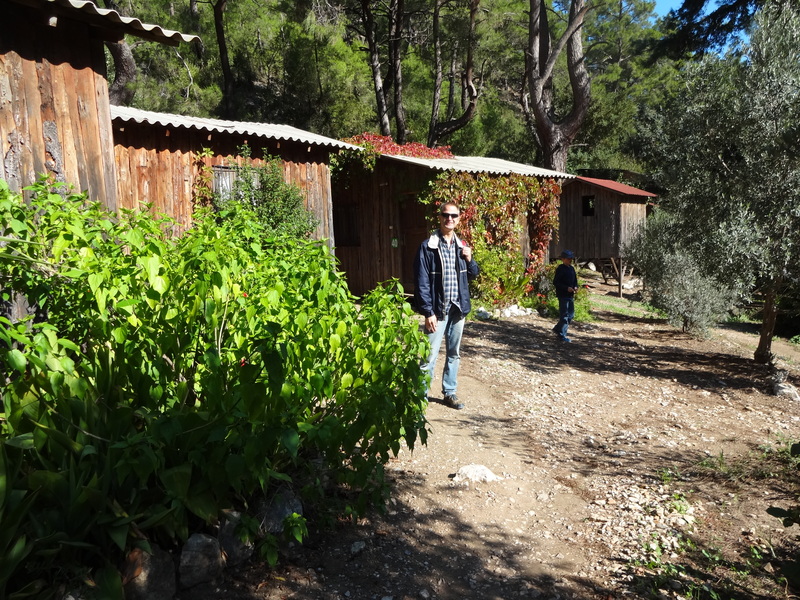 Andy first visited Olympos with a friend. Here’s the tree house he stayed in! Be sure to try some fresh-squeezed juice! 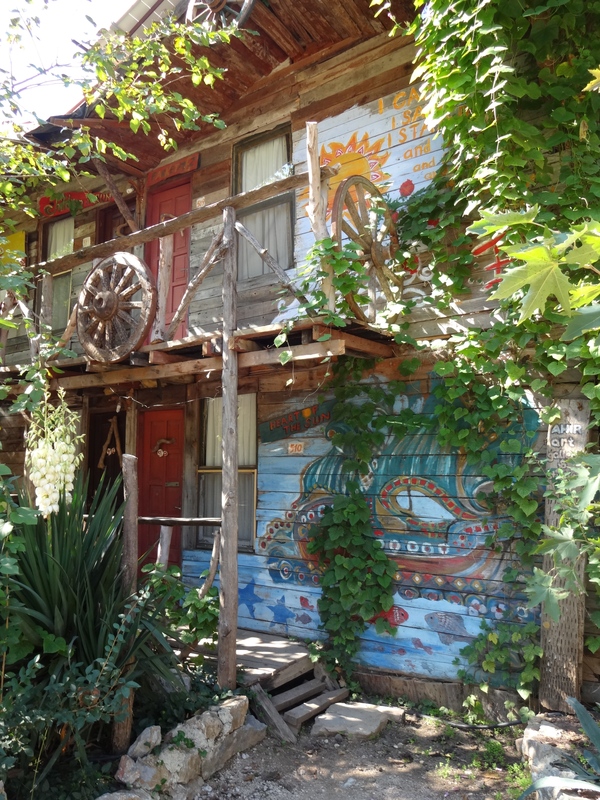 Kadir’s Tree Houses is said to be the original tree house/bungalow pension. 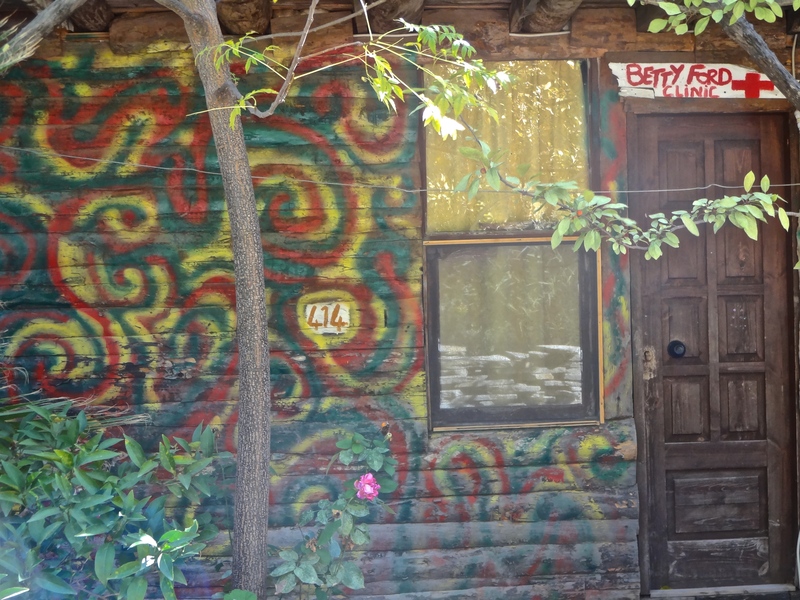 It has a very artistic, hippie-like feel to their cabins, and it’s still very popular with the younger, backpacking crowd. From Saban’s it is a ten minute walk to the entry of the ruins. If you live in Turkey, be sure to get an annual museum pass; you won’t have to pay the 20 TL fee, which also allows you access to the beach. Those of you don’t live in Turkey can get a pass for 10 entries for 7.5 TL. You need to pass through the ruins to get to the beach. The ruins to the right of the creek bed are “untamed” but are worth the hike. It’s the “Indiana Jones hike”. Olympos was founded during the Hellenistic Period, and became a prominent city of the Lycian League by the second century BC. The city was built inside the river valley, behind the mountains, to conceal its wealth from pirates. However, this strategy didn’t work: Olympos was later used as a base by a powerful group of pirates. There was an infamous pirate called Zeniketos who operated from Olympos. After the ruins you arrive at the sea! A Roman commander of Julius Ceasar conquered the city in the first century BC to neutralize the threat from the pirates. People continued to live in Olympos until its decline in the 1400’s. This was a lovely October day. Notice my twin on the right. We returned for a quick weekend trip in May. This time we stayed at Olympos Orange Bungalows, which also was a good place to stay: nice food, clean rooms, and a lovely garden area. One of the “must-do” things to do near Olympos is something we haven’t done yet: visit the eternal fires of Chimera which are natural gas-fueled flames that are never extinguished. It’s a popular place to hike up to at sunset or after dark. North American visitors are known to bring marshmallows and other ingredients to make smores:) We are told it’s easier to get there if you have your own transport, but you still have about a 3 kilometer hike up (then back down) the mountainside (in the dark), so be sure to wear good hiking shoes and bring a flashlight. So we are told! Nate has been three times; twice while camping with his class, and once while he was at summer camp. Instead, we roasted marshmallows by the fire at Orange Bungalows; we substituted graham crackers with tea biscuits (cookies) and it was GOOD!! You said you wanted a close up on our plates? Ok! So, what are you waiting for? 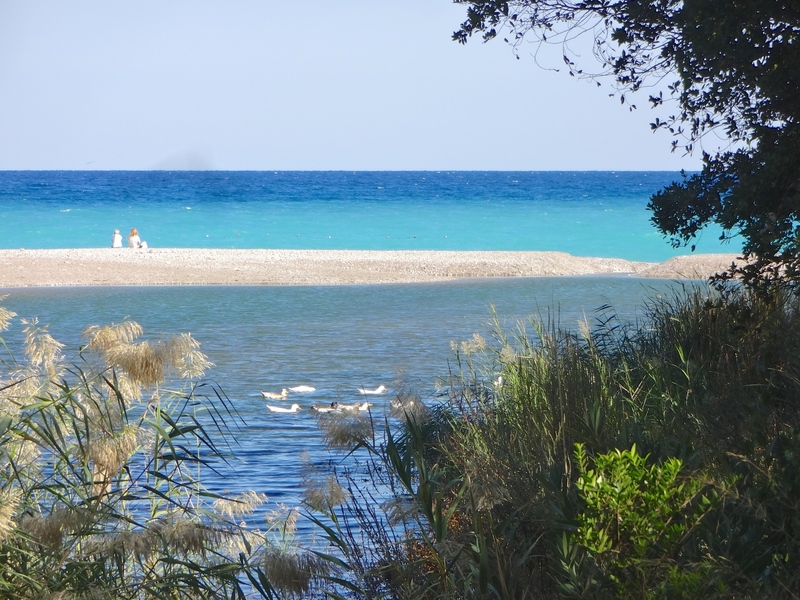 Come and see for yourself why Olympos is a great getaway place!